We are comfortably seated at the Conch Republic bar, sufficiently distant from the screeching duet perched outside on the patio where we’d prefer to be. But I dislike screaming to be heard with my mouth full, and after all, we’re there for dinner. Raw oysters, chowder, the usual. This large sign over the sign at the bar stumped us both. We worked at it for a while, sucking down draft Yuenglings with our oysters, and finally gave up. 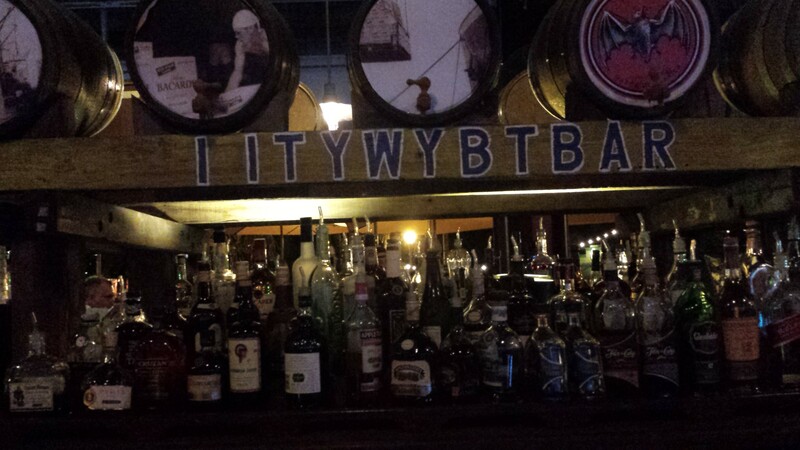 We asked the bartender to interpret. Sure we will. You got it. We laughed for ten minutes and left her a big tip. I love Key West. Extra Credit — free drink for the first one to explain the relevance of the title of this post. Musicians may not apply. “She Walks (Was) Like a Bearded Rainbow,” by Cream, in — was it ’68? You win the internet. Free drinks tomorrow. How do you even pronounce that without spitting or drooling? Ted, having read your comments over the years, I wonder how you can say *any*thing without spitting or drooling, including your name. Funny — I’ve stood in that bar many times and don’t remember the sign. Then again, sometimes I don’t remember standing in the bar, either. Great seeing you and Guido again: don’t wait until September next time, okay?